Mild and variably active weather was the rule in November, thanks to a lack of any cold arctic outbreaks. 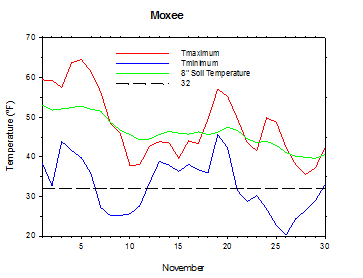 Moxee's average low temperature was 5.5 degrees above average, which makes it the warmest since 1999, and the second warmest since at least 1989. 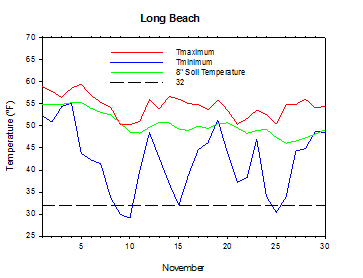 Long Beach recorded only 4 dry days during the month. Aside from cool periods around November 10 and 11 and 26 to 28, most of the month featured above average temperatures. In fact, the chilly period late in the month in central Washington was due to fog and low clouds and a strong inversion, and not a polar air mass. Conditions aloft were relatively mild, which led to above average mountain temperatures. Autumn temperatures were above normal, while rainfall was concentrated into the second half of the fall. Following very dry weather through October 11th, periodically wet and stormy weather dominated the latter part of the season from mid October to the end of November. 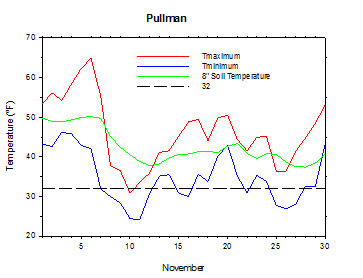 Pullman ended a 103 day stretch of dry weather on October 12th. 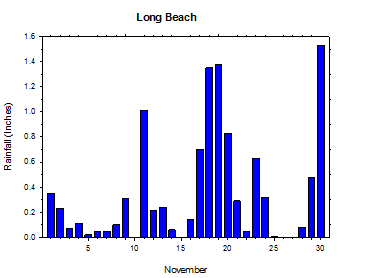 Long Beach, which only had 4 out of 41 possible rainy days from September through October 11th, enjoyed just six dry days during final 50 days of autumn. Rain fell for 15 consecutive days from October 26th to November 9th, and the longest dry streak after October 12th was 2 days. September was warm, very dry, and smoky in places such as Wenatchee. Despite cloud-free skies, as little as 40% of expected solar radiation reached the ground on certain days, including September 18th. 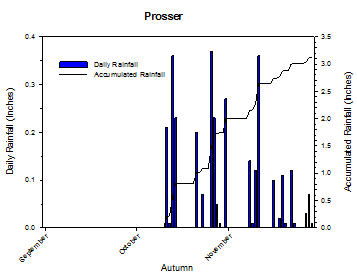 Following a dry start, October ended with wet conditions, making it a changeable month overall. November was generally mild at night, and featured a continuation of periodically wet conditions. Overall, this was the warmest autumn at Prosser (WSU IAREC) since 1998. November began with cloudy and rainy weather, along with above average temperatures, especially at night. Highs were in the 50s and 60s, while lows ranged from the upper 30s to mid 50s. Parts of north central Washington near Oroville received upwards of one-half inch of rain on November 1st, while areas around Olympia received in excess of 0.5 inches. More rain clipped especially northwest Washington for much of the first week of November, as temperatures remained relatively mild. Highs on November 4th and 5th were as warm as the low 70s around the Tri-Cities/Walla Walla areas, while lows were in the 40s and 50s, with upper 50s around Vancouver. Over 0.5 inches of rain fell at Tokeland on November 4th. Following warmth through November 6th, a significant pattern change occurred around November 7th, as a cold trough of low pressure moved into the region. Lows on the morning of November 8th were as cold as 22°F at Brewster Flat. Temperatures fell to below normal, as showers affected some areas on November 9th. Highs were only in the 30s and 40s, with lows in the 20s, as the coldest weather of the year arrived courtesy of a chilly trough of low pressure. Snow fell around Spokane on November 9th, with light accumulations. On November 10th, the temperature at Almira dropped to 17.7°F. 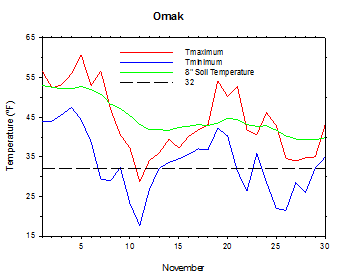 Highs were as cold as 29°F at Omak (Pogue Flat) on November 11th. Rain and snow affected eastern Washington beginning on the evening of November 11th, as a storm interacted with cold air over the region. Snow fell in the mountains, as well as most areas of the eastern Washington north of an Ellensburg to Pullman line. High temperatures rose into the 30s and 40s, except 50s in western Washington on November 13th, while lows were in the 30s and 40s, except for isolated 20s. Lingering low clouds led to moist and cool daytime conditions through mid week, although warmer lows in the 30s affected eastern Washington. A brief, weak ridge of high pressure on November 14th and 15th gave way to more active weather beginning on November 16th, which lasted through the rest of the month. Highs on November 15th were in the upper 30s and 40s east of the Cascades under low clouds. However, western Washington reached into the mid 40s to mid 50s. Low temperatures were generally in the 30s. 2.3 inches of rain fell at Tokeland on November 18th, and highs were in the 40s and 50s across the state. A strong storm on November 19th caused strong southerly winds across south central Washington, as sustained winds (gusts) peaked above 40 (50) mph at Canoe Ridge. The warm winds allowed temperatures to soar into the 60s around the Columbia River and Tri-Cities areas. The high temperature was 68.1°F at Wallula, while the low at CBC Pasco was only 52.1°F. 3.1 additional inches of rain fell at Tokeland, as heavy rain and high elevation snow also affected the mountains. November 20th saw slightly cooler but still above normal temperatures, as nearly an inch of rain fell in southern parts of the state from Long Beach to Huntsville. Snow fell in the mountains as well. It was a typically stormy Thanksgiving week that featured heavy rain, flooding, landslides, high winds, snow, and temperatures swings. The National Weather Service reported wind gusts up to 98mph on the Oregon Coast. A brief reprieve from the wet and stormy weather arrived late on the Wednesday travel day, although strong and sustained southwesterly winds up to nearly 40 mph affected central and eastern Washington. Following drier and calmer weather on Thanksgiving Day, another system moved into the region on November 23rd with rain and warmer temperatures. Cooler and drier air moved into the region on November 25th. Clear skies and dry air allowed temperatures to fall below 19°F at Broadview (Ellensburg) on the morning of November 26th. Despite warming aloft, stable conditions allowed low clouds and fog to persist through the day in parts of the Columbia Basin, which limited high temperatures to around 30°F from November 26th to 28th. However, increasing southwesterly flow allowed wetter and milder weather to return at the end of the month. 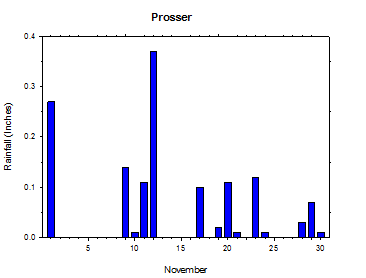 The average November temperature at Prosser (WSU IAREC) was 42.1°F, which is 2.2 degrees above average. The average high temperature was 48.9°F, which is 0.5 degrees above average. The average low temperature was 35.9°F, which is 3.7 degrees (1 standard deviation) above average. The maximum temperature recorded last month was 68.0°F on November 5th, while the coolest daily high was 33.3°F on November 28th. Low temperatures ranged from 49.4°F on November 4th to 24.7°F on November 26th. Daily average temperatures ranged from 57.6°F on the 5th to 29.4°F on the 27th. The monthly rainfall total was 1.38 inches. The average wind speed was 3.2 mph, and the average 8 inch soil temperature was 49.6°F. 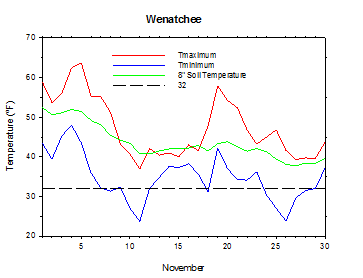 Wenatchee (WSU TFREC) recorded an average temperature of 40.6°F, which is 3.1 degrees above average. 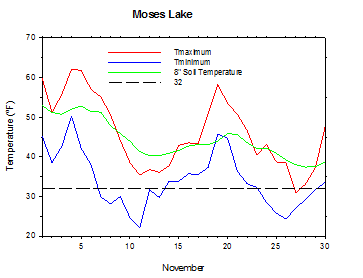 November 10th: The low temperature at Almira fell to 17.7 degrees. 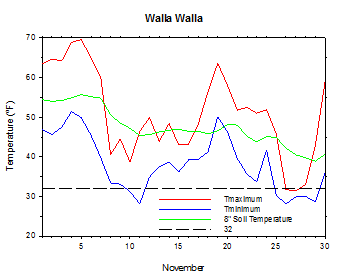 November 19th: The high temperature rose to a balmy 68 degrees at Wallula. November 27th: The high temperature at WSU Othello was only 29 degrees. 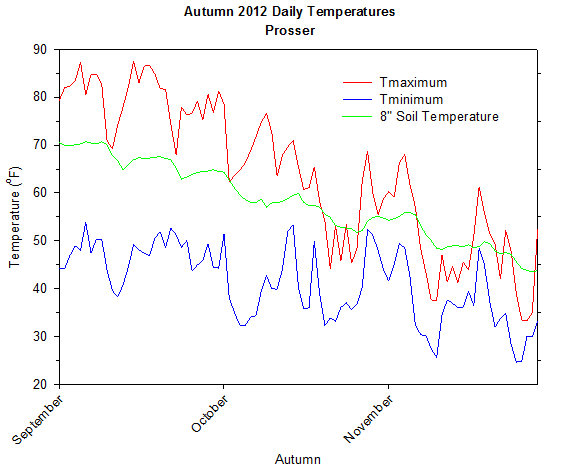 September weather behaved as a continuation of the summer, with generally warm and dry conditions throughout the month. A dry lightning storm early in the month sparked many dangerous wildfires, which persisted into early October. Stagnant conditions caused thick smoke and poor air quality in eastern Washington for much of the month. Wenatchee was especially impacted by dangerous breathing conditions. With the exception of a cold storm on September 10th, most of the month was warm and meteorologically uneventful. Dry weather continued in early October, although a dramatic pattern change on October 12th led to wet and stormy conditions for the rest of the month. October was a changeable month which saw both summer and winter-like weather. While hot weather, dry spells, wildfires, and smoky skies ended early in October, wet, stormy and even snowy weather was observed later in the month. Despite rain-free conditions for the first eleven days of the month, Long Beach ended the month with nearly 13 inches of rain. A shot of cool and dry air early in the month caused windy conditions and cold overnight lows for places such as Pullman. Much of the rest of the month was dominated by wet weather and mild overnight temperatures. 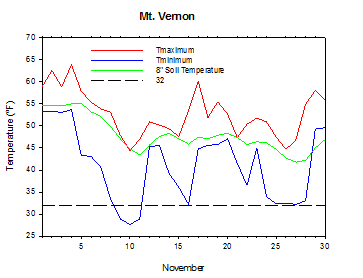 However, cold day-time temperatures and mountain snowfall arrived for a few days beginning on October 20th. In fact, October 22nd was the coldest day to that point since March. The average autumn temperature at Prosser (WSU IAREC) was 52.0°F, which is 1.1 degrees above average, and the warmest autumn since 1998. The average high temperature was 64.0°F, which is 0.7 degrees above average, while the average low temperature was 41.1°F, which is 1.4 degrees (1 standard deviation) above average. Daily high temperatures ranged from 87.5°F on September 15th to 33.3°F on November 28th. 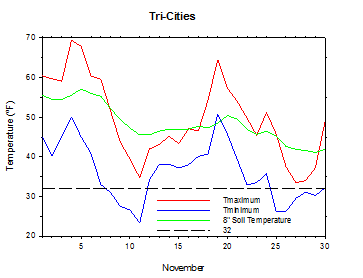 Low temperatures varied from 53.9°F on September 6th to 24.7°F on November 26th. Daily average temperatures ranged from 69.2°F on September 6th to 29.4°F on November 27th. 3.12 inches of rain fell during the autumn season. The average wind speed was 3.6 mph, while the average 8 inch soil temperature was 58.1°F. Other locations also experienced above normal autumn temperatures. 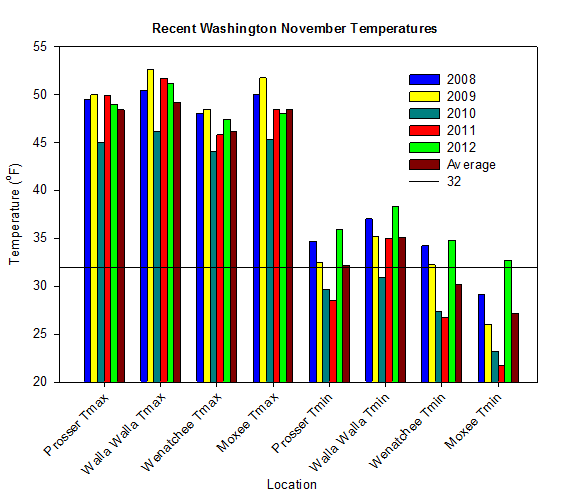 Wenatchee (WSU TFREC) had an average autumn temperature of 51.1°F, which is 1 degree above average. 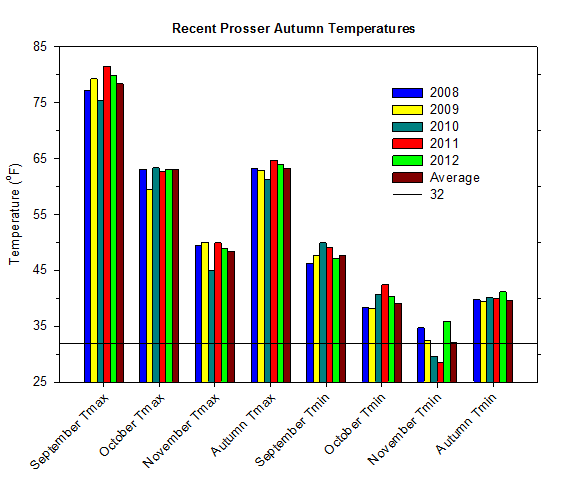 Overall, the autumn of 2012 was slightly (0.2 degrees) warmer than the autumn of 2011 at Prosser (WSU IAREC), although the overnight temperatures were significantly (1.1 degrees) warmer. September 7th: The temperature at WSU Vancouver soared to 94 degrees. September 8th: The temperature at WSU Tri-Cities climbed to 94 degrees. October 5th: The temperature at Pullman fell to 18 degrees. October 12th: The streak of consecutive dry days at Pullman ended at 103 days (July 1-October 11). 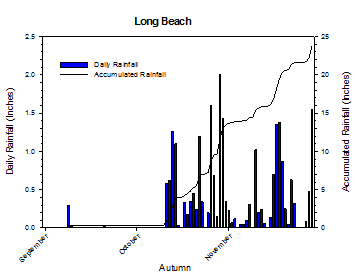 October 31st: The monthly total rainfall at Long Beach was nearly 13 inches. September: Warm, smoky, and very dry. November: Mild, especially at night. In November, continued periodic wet weather helped winter wheat growers by increasing soil moisture. However, heavy rain in western Washington led to flooding of hayfields and pastures. Christmas tree farms were open in Snohomish County, while apple harvest was completed in Yakima County (National Agricultural Statistics Service). 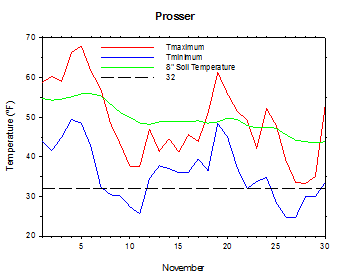 On November 13th, 1999, the temperature rose to nearly 74 degrees at Prosser (WSU IAREC). According to the Climate Prediction Center (CPC), near average temperatures and above average precipitation is expected in Washington during December, with generally seasonal conditions for the 2012/2013 winter season. Neutral ENSO conditions are likely into the spring of 2013.